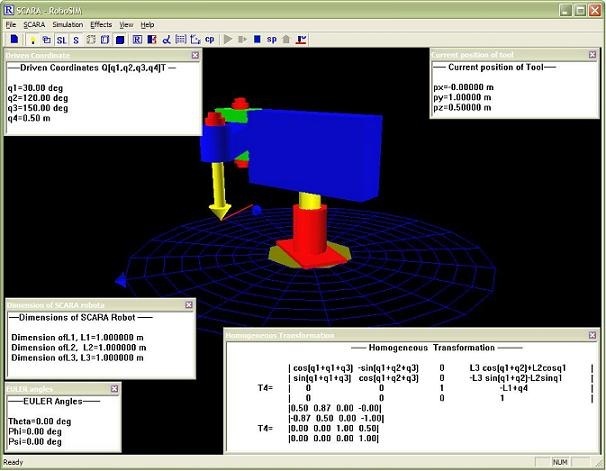 RoboSim is MFC/C++ application for simulation of SCARA robot. The application is a part of my diploma work. RoboSim application is using OpenGL graphic library for 3D scene, as well as various matrix transformation for moving robot. With RoboSim you can simulate process of welding and transporting with the robot. More information can be found on my diploma work at 73-80 pages. During simulation you can see various parameter like homogeneous transformation, driven coordinates, current position of tool etc. The application can be download from this link.